Some weddings you circle on your calendar. The waiting seems too much. Like Christmas in the summer it hangs there taunting you, willing it to be the day when you can be there. To see those amazing people again. To laugh, to embrace, to feel like part of the family again. 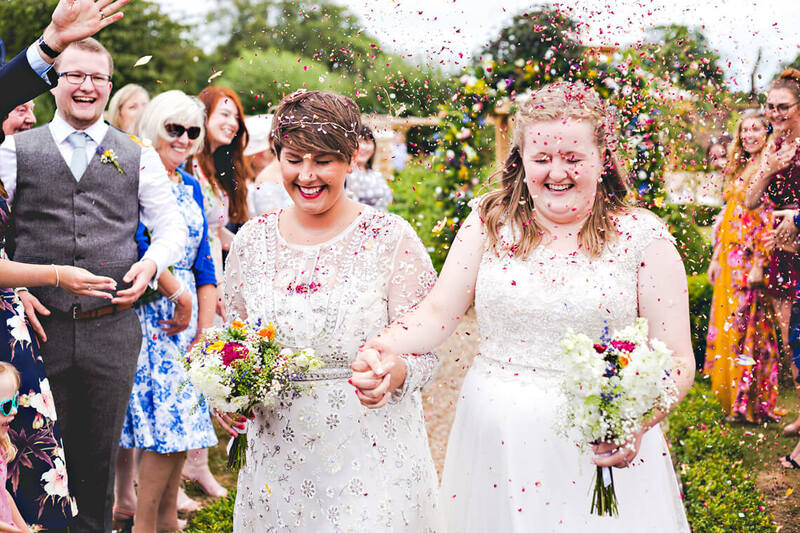 Bec and Lou’s wedding at The Secret Garden in Kent was one of those weddings. This all starts a few years ago with Jess and James’ wedding at Gate Street Barn. When I arrived I didn’t know the high I would experience as they day went on. How gutted I was when it was it was over. I also didn’t know that I would be lucky enough to once again enjoy that feeling a few years later. When Jess’ sister Bec gets married to her partner (now wife) Bec. There’s only one part of the day I wasn’t sure of. My rock steady connection with all of Bec’s family was a given. But Lou? This was the unknown. Would I be as welcome with them as I am with Mr Incredible et al? Oh boy. Am I! When you jive you jive. And we jived. Boy did we jive. This all starts in Whistable at the most incredible AirBnB. Kitch and very Soho it was. Who ever owned it had style. Warhol. Jagger and McCartney. Super Heroes. It oozed likeability. Just like Bec and Lou. They chose to get ready together yet seperate. So in a rare scenario Darren and I were at the same ‘prep’ location. Him in one room, me in the other. We did cross over and move about and generally try to see a different side. The light was insane. The people moreso. All of this just feeds into the day that is coming. Off we head to The Secret Garden. What can I say about it. It’s a working garden with a cafe and some unique small holdings. For the wedding they had exclusive access and since the venue doesn’t hold massive numbers it always felt ‘at home’ with the guests they put in it. The gardens were welcoming with more than a few raspberries tasted from the garden. Bec and Lou travelled together to the venue but then went separate ways in order to make a very touching entrance. A coordinated arrival with each Dad escorting them to the ‘aisle’ when they joined hands and made the final meters together with Dads behind. With the ceremony outside, it certainly added to the sense of occasion and with the murky weather of the morning giving way to puffy cloud the stage was set for a tremendous afternoon of hugs, conversation and garden games. I could write on. Tell you about the heartfelt speeches and amazing afternoon tea. The delightful cake and earthy decorations. But I’m going to leave the photos to tell that story. My one home is this. Two kids down, one to go. I hope I get to join this crew again. Very very soon!